As part of their centenary birthday celebrations, BMW has released a range of inventive vehicle concepts, titled the ‘VISION Next 100’ series. 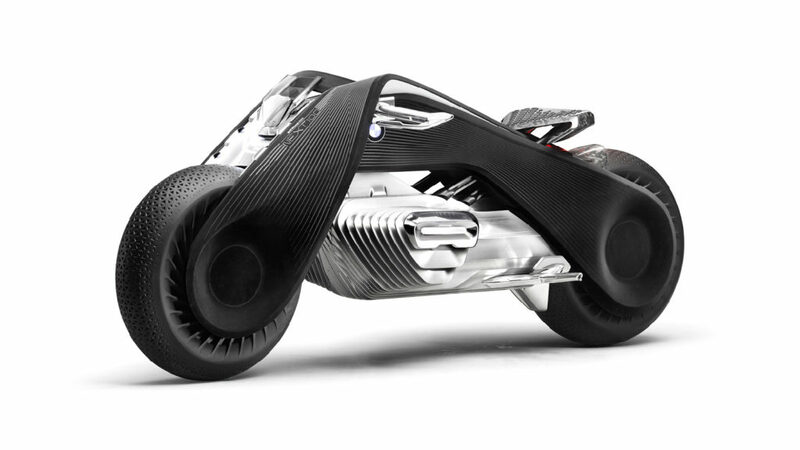 With this range, BMW tries to envision what the next one hundred years of transportation will look like. One of their latest reveals is the Motorrad Vision Next 100, a futuristic zero-emissions motorcycle that boasts an advanced self-balancing system, executed via a gyroscopic stabiliser, which will keep the bike balanced in motion and when stationary. The bike will still be fitted with a kickstand though, as the self-balancing function is only functional when the bike turned on. To avoid collisions with the obstacles around it, the Mottorad 100 also has what BMW calls an “electronic safety cage”, a system of sensors that are constantly communicating with the bike and surrounding world so that a crash can be prevented. According to BMW, this system is so advanced and capable that it would essentially eliminate the need for the driver to even wear a helmet or any protective gear. Who needs a dashboard on a motorbike when the BMW bike uses a smart display? But their futuristic vision doesn’t end there. Instead of the standard dashboard, which has completely been omitted, the driver will wear a visor that acts as a smart display. Although this technology sounds amusing I can’t help but feel that the visor’s digital projections could be more of a dangerous distraction than an exciting novelty. BMW did state that when looking straight the driver won’t have any unsolicited feedback on-screen though, except in the case of an emergency. But driving without a helmet is about more than safety. If you’ve ever driven a bike faster than 100kph in the rain you’ll know that a raindrop feels like stone hitting your face. The same goes for bugs, an ever present annoyance of the road. To complement its futuristic features, the Mottorad 100 sports a sleek, elegant and ultramodern style making it look like something that drove straight out the world of TRON. The bike is fitted with carbon fibre bodywork placed around a single unit frame and wheel, meaning that the body will shift in conjunction with the wheels allowing for the effective use of the self-balancing system and better aerodynamics. The bike has a flexible frame, meaning there is no need for joints. There are also no traditional shock absorbers present and it will be up to the sophisticated tyre design to smoothen the ride. These tyres are also able to change their tread to suit any road conditions. But beyond all its innovative glam, it’s interesting to note that this bike is actually modelled after the 1932 R32, the first motorcycle ever released by BMW. At present, there is not much known about the engine specifications of the bike but one thing that’s for certain is that it will be a fully electric vehicle. This is to keep with the growing trend of electric-powered cars, something BMW is very intent on. When considering the Mottorad 100 in a South Africa context there are a few concerns that come to mind. South Africa not necessarily known as the hub of BMW operations and our electronic vehicle services are still not nearly on par with the more developed countries. How do you charge this futuristic piece of equipment? Will you be able to charge it with a your standard house hold plug or will you need to visit a specialised EV charge station, of which South Africa has very few (most situated in and around Johannesburg). You will also need to service your vehicle. Handling such a unique and sophisticated motorcycle will need very skilled and specialised technician and they will probably also be few and far between. Then there is also the factor of the ever-rising expenses of electricity. How long will it take and how much electricity will be needed to fully charge the Mottorad 100? When looking at these limitations owning such a bike in South Africa will probably be beyond affordable for the average citizen and a practically unsound mode of transportation.